An artists impression of Ostrovets Nuclear Power Plant. Source: Belarus AEC.After Fukushima, you might think that nuclear power is a thing of the past. Or that our focus on climate is the only issue of public concern when it comes to the energy sector. Yet the recent Meeting of the Parties to the Espoo Convention, which deals with environmental impact assessments across borders, was hi-jacked by ongoing disputes over reactor construction and lifetime extension. In Minsk, 200 participants representing the 45 states who are members to this UN Convention held heated discussions over problematic cases, such as Hinkley Point C (UK), Ostravets (Belarus) and a number of old Ukrainian reactors going through their lifetime extensions. This dispute has arisen largely because the rules on who has a say when decisions regarding nuclear operations are made are unclear. Which countries and their citizens should be notified and involved in decision-making on a new nuclear installation such as Hinkley Point C? 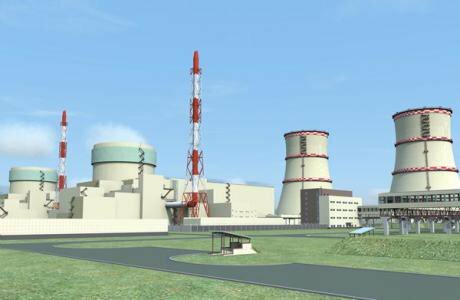 And how about extending the lifetime of old reactors, like the Yuzhnoukrainsk power plant in south Ukraine? These are questions to be addressed in the framework of the Espoo Convention. But are we really solving the dilemma of whether nuclear operations can have a significant transboundary impact, which should, according to the Espoo Convention, trigger communication across borders with potentially affected parties? Or are we witnessing a political game, fueled by self-centered interests of nuclear positive countries and the nuclear business, which is trying to remodel itself by “climate-neutral marketing” of its product? The recent Meeting of the Parties to the Espoo Convention was an unfortunate display of the influence that politics and the nuclear lobby have over decisions with severe impacts on health and environment. One of the most important tasks of the Meeting of the Convention parties, which convenes every three years, is to endorse draft decisions on non-compliance. These are prepared carefully and over the course of few years by the Convention’s Implementation Committee. Such decisions, despite being tailored to each specific case of challenged non-compliance, should have general implications across similar cases, reflecting the principal of an equal treatment. Endorsed decisions should bring needed clarity — in this case clarity concerning rules for nuclear decision-making. Unfortunately, the Minsk meeting has torn the draft decisions apart with last minute revisions, which were agreed behind the closed doors of “coordination meetings” and “ad hoc working groups”. Civil society members, whom this (and some other) UN environmental convention assigns a special role, were closed out from all key deliberations. At some point, shortly before midnight on the penultimate day of the Meeting, most participants lost track of a number of parallel meetings and groups. At the end of this political show there were too many revisions proposed to be seriously considered. All decisions were postponed for an extraordinary meeting to take place in the course of the next year — just when the clarity on how to proceed with all the nuclear decision-making concerning old and new nuclear installations is much needed. Confusion continues, which lowers efficiency of the Convention on nuclear issues. The main purpose of the Convention — to be an instrument for a more inclusive decision-making leading to a better protection of environment — was abandoned. To end on a hopeful note, there are three almost positive developments resulting from the Meeting. First, the mere acknowledgement that there is a lack of clear rules for nuclear decision-making. In Minsk, this became obvious and the issue finally “came out of the closet”. Second, delegations as well as other participants seemed to have agreed in principle that when a state is making a decision on a nuclear project, they should send notification to potentially affected countries, and that the fact that a severe accident can cause widespread impacts has to be taken into account. Thirdly, on the topic of extended operations of old nuclear units past their officially designed lifetime, the Meeting created a working group to clarify the need for transboundary environmental assessments. This particular issue generated significant interest among different mostly EU countries. By expressing their interest to be members of this working-group, states have acknowledged the relevance of this issue. This is hardly surprising: Europe is heading into a decade when 93 nuclear reactors will be (or not) up for their lifetime extension. And one does not need to be a nuclear scientist to understand increased risks associated with any aging technology, let alone nuclear. Nuclear safety is a matter of high concern and relevance to all of us. We have a right to be asking questions related to nuclear operation, to receive good quality answers and demand highest possible safety measures. This is all possible in the frame of the Espoo Convention on the environmental impact assessment in transboundary context. What we need now is to make it work. The international working group created in Minsk should make it crystal clear that lifetime extensions of nuclear reactors require broad engagement and public participation across borders. Resistance of some governments and the European Commission to this logical solution to nuclear decision-making is dangerously illogical. If “everything is ok and safe” as we are being assured, then why is wider public participation on decisions with immense potential impact generating so much opposition? European citizens don’t want to be left out of decision-making. It is important to renew our trust in political governance to feel that our interests are duly accounted for and represented — on nuclear issues, democracy from behind the closed doors can have fatal consequences.